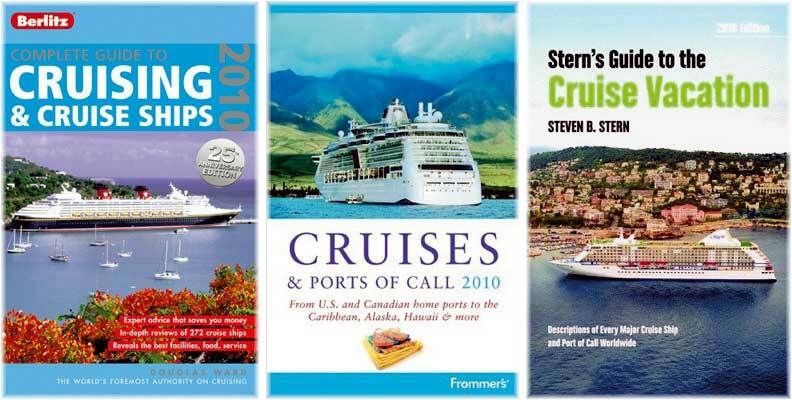 Not that many years ago, there used to be annual cruise guides issued by the "three F's" - Fielding's, Fodor's and Frommer's, but today the big three are the "Berlitz Complete Guide to Cruising & Cruise Ships" (692 pages), now in its 25th edition, "Stern's Guide to the Cruise Vacation" (736 pages) in its 20th edition since 1974, and "Frommer's Cruises and Ports of Call, Complete" (704 pages), whose first cruise guide appeared in 1985. Frommer's also produces individual volumes for Alaska, the Caribbean, Europe and North America. All three have recently published their 2010 editions and The Cruise Examiner has had a look at how they compare. The Berlitz guide is compiled by Douglas Ward, who began his career as a jazz and dance band leader on the first Queen Elizabeth and now lives in the UK. Over his career he has spent some 5,500 days at sea and participated in over 990 cruises and 154 Transatlantic crossings. The first edition that appeared in 1985 covered just 120 ships, less than half the number Berlitz rates today. The Berlitz guide is best known for its rating system for cruise ships, along with the fact that the vast majority of the book is taken up by reviews of the individual ships. Berlitz scores each ship on the basis of a possible 500 points for Ship, 400 each for Food, Service and Cruise, 200 for Accommodation and 100 for Entertainment, totalling 2,000 points. So the way Douglas Ward sees it the ship and the cruise take up half the weighted score and entertainment (even though Ward was once part of it) 5% of the overall points, while food and service together account for 40% of the scoring system. The Berlitz rating system goes up to five stars and, once again in 2010, as for the past ten years, Hapag-Lloyd's Europa is the only ship to achieve five-stars-plus, a rating that the previous Europa had also achieved. Among shortcomings of devoting up to two pages to each of 271 ships is an inevitable amount of duplication, not only among sister ships in the same fleet, but also of commentary such as there was not enough variety of breads or cheeses or this ship does not provide cushions for its deck chairs and so on. 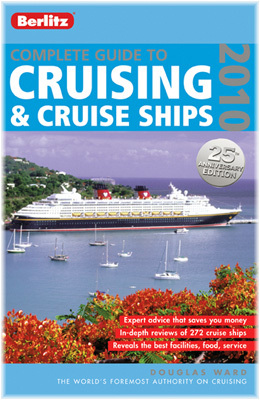 However, the introductory section now includes a couple of hundred colour photos (although many are the size of postage stamps) and covers a number of interesting subjects such as the effect of the credit crunch on cruising, the resurgence of class, the loss of some of the trappings of traditional cruising, what's new in the world of cruising and industry trends. As well, it lists the biggest suites afloat. Berlitz claims to be used by 35,000 North American travel agencies and in the UK one cruise agent alone gave away 10,000 copies in the past year in return for ship reviews to be published on its own web site. Steven Stern, a retired Chicago lawyer now living in Boca Raton, has sailed on more than 750 ships, most of which he managed by spending three months a year during his law career researching cruise lines and cruise ships (he also publishes a volume on resorts). One of the most noticeable (and useful) things about the Stern guide is that it publishes at least one menu and one daily program for each major cruise line in order to give a taste of the experience and what goes on on board ship. And included in his reviews of almost 300 ships are 223 black and white photos illustrating many different aspects of cruising and the ships he is writing about. One thing Stern does that American guides have traditionally not done is to include European lines such as Aida, Fred Olsen, Hapag-Lloyd Cruises, Hurtigruten, P&O Cruises, Peter Deilmann and Viking River, not to mention Louis and Swan Hellenic, plus Asian and Australasian operators such as P&O Australia and Star Cruises. Stern allows up to six stars in his rating system, which of course the Europa achieves. But the two Crystal ships, Queen Mary 2 and Queen Victoria in their Queen's Grills, Regent's Seven Seas Mariner and Voyager and the whole of the Seabourn and Silversea fleets achieve six-stars-plus. However, the SeaDream ships achieve only five-stars-plus compared to top ratings with Berlitz (see below). While Stern has chosen to rate most ships, many, mainly coastal and river ships but also those of Aida, are not graded. One thing he does though is to categorize them into four groups: Deluxe, Premium, Standard and Economy, within which groups he then awards up to six stars. 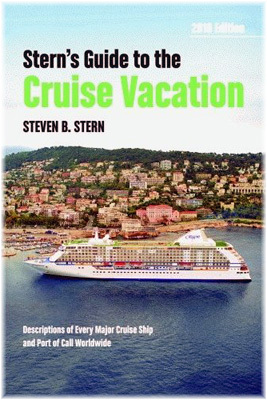 One of the peculiarities of this book is that pictures of Stern are liberally scattered throughout his work, as if to prove he has been there, but he is able to bring up much more detail than the Berlitz system allows outside its ships' commentary sections - in terms of planning a cruise, how to book it and how to get the best price. For those interested in the actual destinations as well as the ships, Stern provides one of the most complete guides of the three reviewed today, and while his rating system is not as detailed, his conclusions and the reasons he gives for them hold true. Unlike Berlitz and Stern's, Frommer's covers only ships sailing from North America, so this makes it immediately less useful for an international reader. Not only are lines such as P&O and Aida excluded but neither is there any coverage of American-based river operators who run ships in Europe. 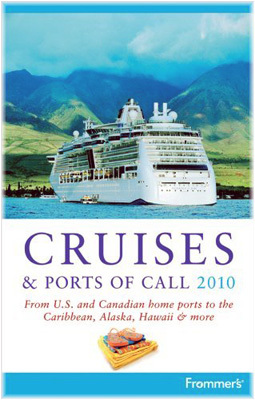 Frommer's divide the market up into three chapters on the mainstream lines, the ultra-luxury lines and small ships, sailing ships and adventure cruises, while the ports are divided up into the US mainland, Caribbean, Alaska and British Columbia, Mexico, Bermuda, Hawaii, New England and Eastern Canada and US river ports, with no coverage for the rest of the world. Rather than just stars, Frommer's uses a rating system from 1 to 5, with the best being 5 and rate the lines rather than their ships, describing the line in a nutshell, the experience and a section on pros and cons which is very useful. It also gives a more detailed passenger profile for each line. Frommer's also reviews ships by classes, which avoids repetition when so many ships in each fleet are sister ships these days. Ships covered: almost 300 worldwide. Ships covered: those sailing from North America only. For those who want an analytical approach the Berlitz guide provides that detail and for those who want an anecdotal approach Stern's provides more detail on aspects other than the ships than does Berlitz, eg. best beaches, cruising for tennis nuts, joggers etc. Frommer's meanwhile can only be of interest to those in North America or those planning to visit there, which is why European bookshops stock Frommer's in their American section. For those who might want to buy all three cruise guides (more than 2,100 pages of information), Amazon has a discounted package that amounts more or less to all three guides for the price of two. And at the bottom of the Berlitz list? The small US-flag coastal cruisers operated by the likes of Lindblad, American Canadian Caribbean Line and American Cruise Lines. And what does Frommer say about them? "Very casual, and for the most part very plain." And as for Stern, well he just does not rate these ships, but he does give a "strong points" commentary for some, as he does for all the larger lines, and Berlitz gives us a "best for" rating in terms of the type of passenger each ship is best suited for. Frommer's contribution is its pithy "The Verdict," which is given for each line. Whatever one says, the extent of detail given in all three guides is good not only for the novice cruiser finding their way around the hundreds of opportunities that now exist, but also for the veteran cruiser who wants to know the latest about the newest ships. This market is changing constantly, not only in terms of the delivery of new ships but also in terms of which lines are still there and which might have been taken over by others.